Wafer Cleaning Tool: A complete vacuum system including customized MASCOT-300 loadlock and process chamber for the development of a novel ion source wafer cleaning tool. 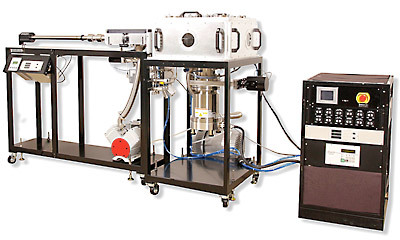 This system is high vacuum compatible and has a vacuum compatible linear/rotary stage with UHV Transfer UHV compatible optical limit switches within the process chamber allowing the end-user to position any point of a 200 or 300 mm wafer underneath the cleaning source. The motion control system controls the stage as well as interlocks the gate valve to prevent it from opening with pressure differential across it. This was a fully integrated platform with pumps, gauging, backfill and a frame.